A new agreement between Russia and the European Union is on the table as the European Commission Vice President Catherine Ashton visits Moscow - the first time since her appointment as the EU foreign affairs chief. Catherine Ashton met with President Medvedev and Foreign Minister Lavrov. 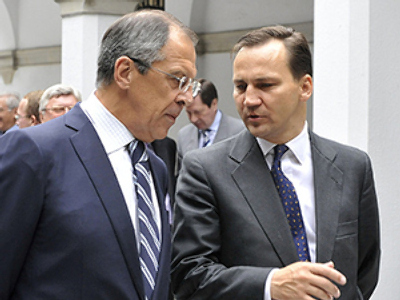 The old agreement between Russia and the EU expired in 2007, but was automatically renewed. Talks on a new agreement began in July 2008, but after the war in the South Ossetia, the EU leader froze any talks on signing a new agreement. Now Russia hopes that, after the Lisbon Treaty came in force in December last year, Russia will have a new improved dialogue with EU, since the European Union has a single constitution. Lavrov was also asked on the progress of signing a new START treaty and he said that he is in constant communication with US Secretary of State Hillary Clinton on that issue and that the talks are in progress. During the talks, the two leaders also discussed the issue of global security and the Middle East peace process. “We can announce that we’ve agreed between all the members of the ‘quartet’ to hold a meeting in Moscow on 19th March this year,” Lavrov said. He explained that all the sides intend to “thoroughly estimate the situation – not an easy situation – that has formed in the reconciliation in the Middle East." Catherine Ashton noted that she was “very delighted, that the “quartet” will meet on 19th March." “I will come directly from the Middle East to Moscow. This is a real opportunity for us to think, ‘what else can we do for the peace-keeping process,’” she said. Military analyst and nuclear armaments expert Vladimir Orlov thinks that Moscow and Washington are not far from working together. “While there are discussions on co-operation, if we open the US document on missile defense adopted just weeks ago, we see that Russia's role there is definitely not high. If Russia is not involved in decision-making regarding missile threats, this means that our efforts on strategic arms and offensive weapons reduction are downplayed. We cannot afford that. We need our position to be reflected. We are not that far from working together. Washington should make another effort and then we will be really close,” Orlov says. Analyst Vladimir Yevseev sees potential problems with treaty ratification building up on the U.S. side.